What little one doesn’t love a soft lullaby to coax him or her to sleep. Especially when the lullaby comes from none other than the incomparable Nina Simone. That’s the premise of author Alice Briere-Haquet’s lovely picture book entitled, Nina: Jazz Legend and Civil-Rights Activist Nina Simone. 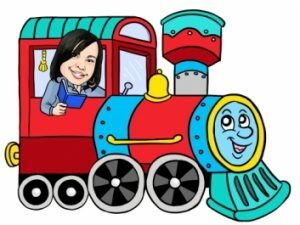 The book opens to soft shades of pencil gray and black and an illustration of an African American mother tucking her sweet child in for the night. The mother acknowledges that her child is having trouble falling asleep, so she decides to tell her a different kind of “good night” story. She tells her about her own life. It is then that the reader realizes the young mother is Nina Simone, and the story she is telling is her own. She tells her daughter about her first childhood memory, when she discovered the piano and marveled over the keys, wondering why the white keys were longer and the black keys were shorter. As Nina’s story progresses, readers learn that this talented lady mastered an array of musical styles, including classical, jazz, folk, blues, pop, R&B, and gospel. She was even asked to give a performance at her church, but when her mother has to give up her seat for some white patrons who want to hear Nina play, Nina refuses…until her mother is given her seat again. 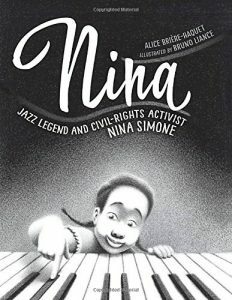 This is a powerful little lullaby-book about the life and times of Nina Simone, and the early years that helped form her character and outlook. Illustrator Bruno Llance outfits this tale — which is soft and quiet and LOUD and alive all at the same time — with lovely black-and-white pencil drawings of African American standing up for their rights, a little black girl who can play the classics as well as any white, and ultimately, Nina’s sweet little daughter who finally drifts off to sleep. 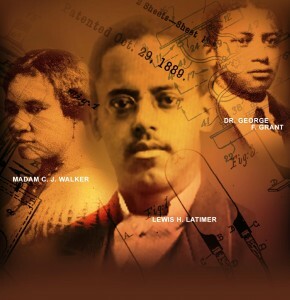 Use this book as a supplemental history lesson about race, class, talent, and the turbulence of the Civil Rights movement. Or…use it to sing your own little one to sleep.